The youthful tour-de-force that is J. Cole made a bold move when announcing that he would be releasing his sophomore album Born Sinner on the same day as seasoned heavyweight Kanye West with Yeezus. Well that day is upon us, and it is a day which has made me wonder yet again if the whole “darker = better” aesthetic is merely becoming the hegemonic formula for the arts, as it’s been working similar wonders for Hip Hop as it did for Christopher Nolan’s ‘Batman’ reboot. Born Sinner is no exception. The first thing to note is that unlike his 2011 debut Cole World, Born Sinner is almost exclusively J. Cole. Any guests (such as Kendrick Lamar and Miguel) are restricted to choruses, leaving Cole alone with his verses, of which almost none are left void of worthy lyricism laced together with a refurbished, fine-tuned flow maintaining the same visceral hunger of Cole‘s debut. That’s not to say the listener is not treated to a more relaxed flow every now and then from the rapper (as he strikes a perfect balance between these tones on joints like Power Trip), but the hunger complements the darker direction taken this time around, facilitating his matured sentimentality rather than merely exhibiting his musical seriousness from Cole World. Once again, Cole is also almost solely responsible for the album’s production, with only Elite co-producing the TLC-collaboration Crooked Smile, and No I.D. co-producing the jazz-tinged Let Nas Down. Cole‘s musicianship is fixated on the album’s darkness, complete with pounding drums, synthesizers, organs, strings and jazzy brass coming together to grant the album a sonic diversity, from thumping double bass groove of Forbidden Fruit (pronounced further by the soft clicks, toned-down drums and the very familiar sample of Ronnie Foster’s Mystic Brew) to the soulful chiming of Chaining Day to the Zen-garden-like atmosphere of Rich Niggaz. Cole flexes his versatility even further by branching out into different styles of Hip Hop beats, so while at one point you will have the (sadly underwhelming) upbeat rhythm of She Knows, at another you will be delightfully dragged through the proverbial mud with the heave of Power Trip (thanks in major part to its buzzing bass synths and the heavily slowed sample of Hubert Laws’ No More). The synths on Runaway in particular are juxtaposed by the drums in such a way that how you receive the track is based on your outlook at the time of listening to it – if you imagine a warm and sunny day, it will oblige that image, whereas if you envision something darker, that’s exactly what you’ll be treated to; the latter is arguably the easier one to side with, given the lyrics and the overall darkness of the album, but I implore you to try this exercise out regardless simply to enrich your experience. The bittersweet content is hardly a stranger in more emotional Hip Hop, but rarely do you experience something like this. Contrary to what the title would imply, Born Sinner is not drowned in Christian overtones. Of course, in the process it does deal with your textbook human issues that are explored in emotionally-driven Hip Hop (save for the ego-stroking intro Villuminati), such as lovesickness (Power Trip) and gold diggers (Trouble). Others take on multiple issues simultaneously, such as idolatry and the need for validation (Let Nas Down), or for seemingly myriad matters on Runaway: masculinity and infidelity vs. femininity and the love of a good woman (“When you’re no longer Superman, at least you know you got your Lois Lane“), self-esteem, paedophilia, aging, and racism. Yet in the midst of all the subject matter, Cole stays dark but not necessarily depressing, almost always entertaining and engaging. While it does feel like a waste to merely have the talents of Kendrick Lamar almost squandered and restricted to repetition on the hook of Forbidden Fruit, it’s understandable when you consider that the result of J. Cole helming his own album in all aspects is a heavily intimate experience with him as a person. Despite the few occasions of alienation when braggadocio rears its ugly head, the connection that is built is one that stays with you for the hour’s duration of the album. Arguably the most prominent and important quality that J. Cole is exhibiting on Born Sinner is growth – growth as an artist, a musician, a poet, and a human being. 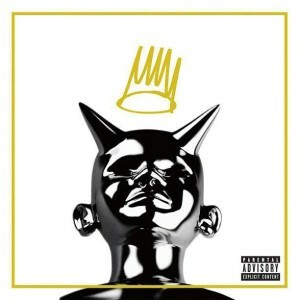 He has carved out a new cradle of self-comfort, and that very comfort adds to how personal this album feels to himself as the creator, and to you as the listener; hearing him in a finely balanced position where he is so passionate yet surprisingly unperturbed is what makes Born Sinner not just a significant improvement on Cole World in every way possible but a new foundation for even more improvement. The fact that it gets better with each listen effortlessly makes it one of the best Hip Hop records of 2013.